Todd and Ben Deremer at a previous bike ride. Todd Deremer is the adaptive physical education instructor at Matheny’s Adult Learning Center in Hillsborough. He has worked at Matheny for more than 16 years and is passionate about the well-being of Matheny’s patients and students. And he is passing that passion down to his son, Ben. 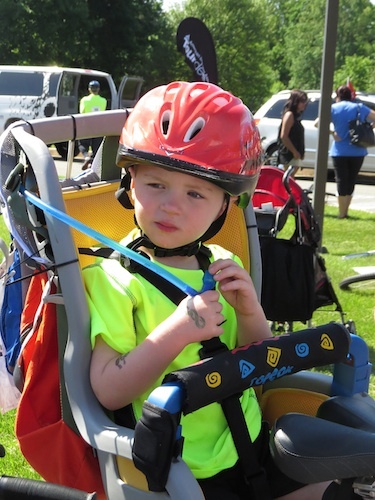 On May 31, at Miles for Matheny, Ben will be joining his father in their “Big Bike Race,” a 25-mile ride. “Once again,” Todd says, “my little man will navigate and call the shots for 25 miles on his bike seat.” Deremer is asking his friends, family and Matheny colleagues to “please support us as we ride for ‘Daddy’s friends at work,’ whom Ben has come to know personally.” As of May 21, Deremer had raised $405. The 25-mile route is one of five cycling rides at Miles for Matheny. Other events include the Lu Huggins Wheelchair Walk, a one-mile Fitness Walk and a Kids Fun Run, all preceded by a “Breakfast of Champions” provided by The Friends of Matheny. 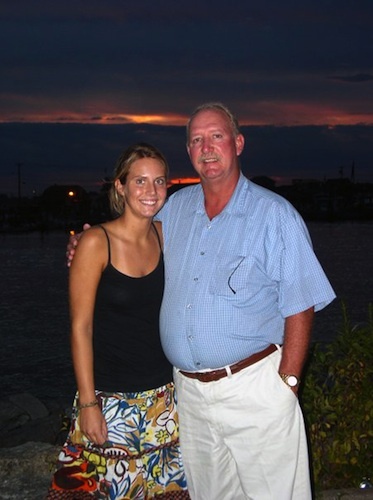 All funds raised at Miles for Matheny will benefit programs and services that enhance the lives of the patients and students at Matheny and serve people with disabilities in the community. Premier sponsor is the Poses Family Foundation. Other major sponsors are: the Golub Family, Mariner Wealth Advisors – Madison, Partlow Insurance, Peapack-Gladstone Bank, Porzio Bromberg & Newman P.C. Attorneys at Law and WCBS Newsradio 880. 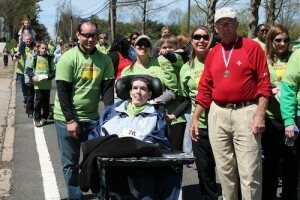 To register or form a fundraising team, log onto www.milesformatheny.org or call 908.234.0011, ext. 260. 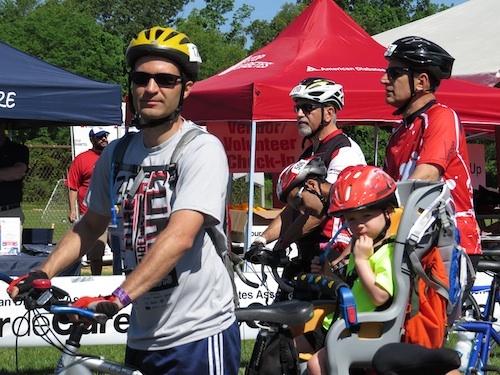 To support Todd and Ben Deremer’s bike ride, log onto the Miles for Matheny website, click on Search for Participant and type in Todd Deremer. As a result, Jaime will be biking 25 miles at Miles for Matheny and also will be participating in the Lu Huggins Wheelchair Walk as a walking partner. 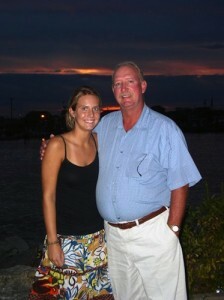 She has formed a fundraising team, Team Jonach, and, as of May 21, had raised $920. 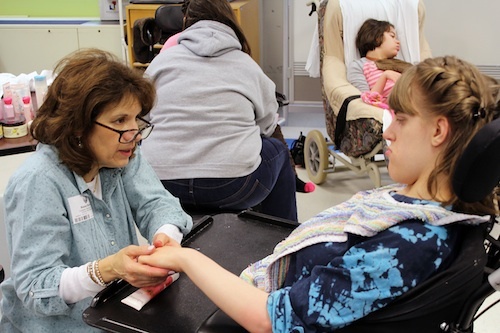 All funds raised at Miles for Matheny will benefit programs and services that enhance the lives of the patients and students at Matheny and serve people with disabilities in the community. Premier sponsor is the Poses Family Foundation. Other major sponsors are: the Golub Family, Mariner Wealth Advisors – Madison, Partlow Insurance, Peapack-Gladstone Bank, Porzio Bromberg & Newman P.C. Attorneys at Law, and WCBS Newsradio 880. 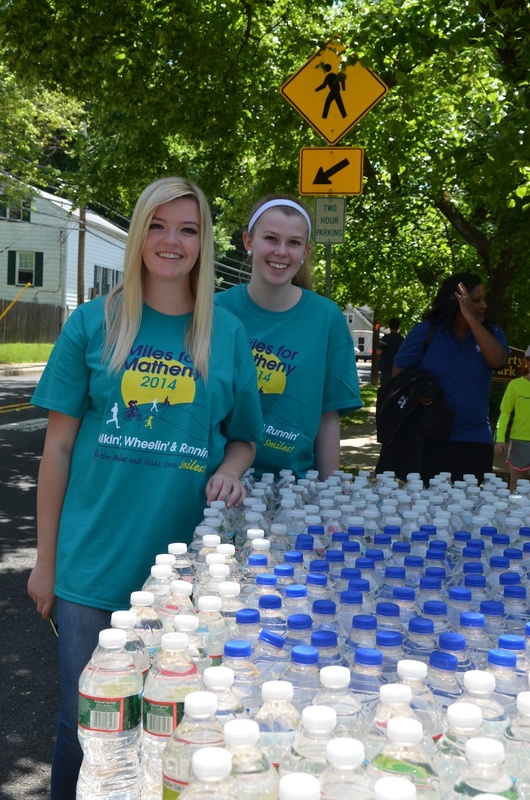 Jordan, left, and Courtney Smith of Bedminster handed out water bottles at Miles for Matheny 2014. That email from new Gladstone, NJ, resident Kristen Huamani, is typical of the community support for the 18th annual Miles for Matheny, the fundraiser and community event being held this Sunday, May 31, at Liberty Park in downtown Peapack, NJ. All five members of the Huamani family will be volunteering that day along with more than 400 others who will be doing things like distributing t-shirts, processing registration, handing out water bottles, greeting Matheny students and patients as they arrive in the park, painting faces, walking with wheelchair participants, forming cheering sections along the wheelchair walk route, cleaning up and helping people park their cars at Pfizer. Groups include the Junior Friends of Matheny (mainly high school students from Bernards and Ridge), members of the Peapack–Gladstone-based Lone Eagle Composite Squadron of the Civil Air Patrol, employees of Peapack–Gladstone Bank and several other school and church groups. Events at Miles for Matheny include the Lu Huggins Wheelchair Walk, the new Fitness Walk, a Kids Fun Run and five different Cycling rides. A “Breakfast of Champions” will be available, courtesy of The Friends of Matheny. All funds raised will support programs and services that enhance the lives of the children and adults at Matheny and provide services for people with disabilities in the community. Premier sponsor is The Poses Family Foundation. Other major sponsors include the Golub Family, Mariner Wealth Advisors, Partlow Insurance, Peapack–Gladstone Bank, Porzio Bromberg & Newman P.C. Attorneys at Law and WCBS Newsradio 880. For more information, log onto www.milesformatheny.org or call (908) 234-0011, ext. 260. 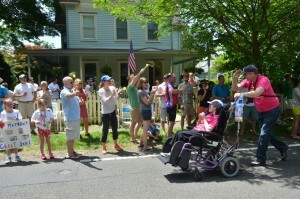 Residents of Mendham Road in Gladstone formed their own cheering section last year for participants in the Lu Huggins Wheelchair Walk. Ridge High students shared the dance floor with Matheny adult resident Yasin Reddick. 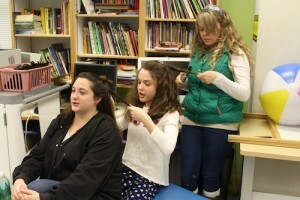 From left, Emily Parker, Anna Hess and Sarah Desatnick. The theme was “Arabian Nights”; the music was provided by the B.D. Lenz Band and deejay Craig Soprano; the decorations were created by Matheny’s Recreation Therapy Department; and music therapists accompanied belly dancers as students and patients entered the Skylands in Randolph, NJ, for the Matheny Prom, held on Thursday, May 14. The prom is widely anticipated by the teenagers and adults at Matheny. 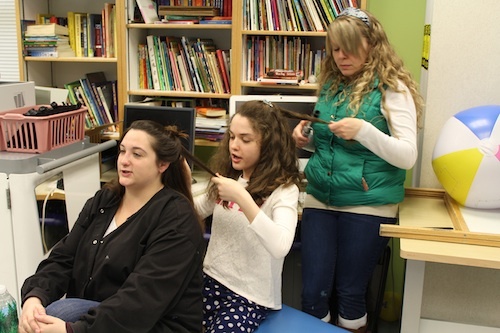 The girls and young women in attendance received a special beauty treatment earlier in the afternoon given by volunteers from Kaleidoscope Hair & Body Artistry in Basking Ridge, NJ. 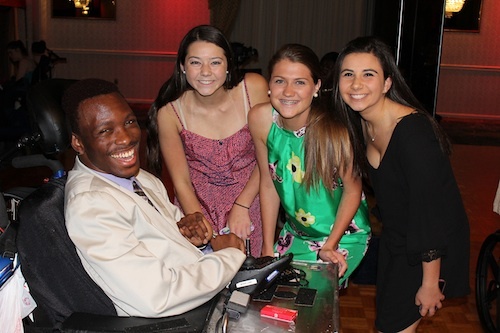 And the evening was enlivened by the attendance of several members of The Junior Friends of Matheny—students from nearby Bernards and Ridge High Schools—who brought a special community spirit to the event, serving as dancing partners and good friends to the promgoers. 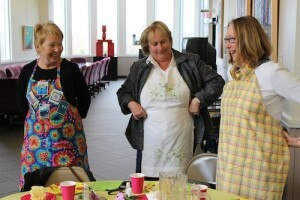 The prom is an example of Matheny’s efforts to enrich the quality of life for people with developmental disabilities. The evening was coordinated by the Recreation Therapy Department, which is responsible for providing students and patients with a variety of recreation opportunities and resources to improve their physical, emotional, cognitive and social well-being. The event was funded by a donation from Novartis. 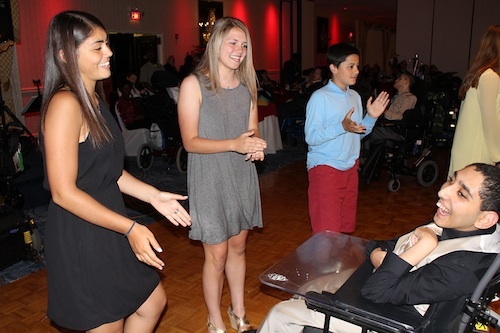 Raissa Rojas, left, and Emily Maheras of Bernards High on the dance floor with Matheny student, Mohamed El Yamany. Brad Orton examines the merchandise under the watchful eyes of shop volunteers Lynn Nickerson, left, of Bernardsville, NJ, and Arlene Rafalko of Gillette, NJ. 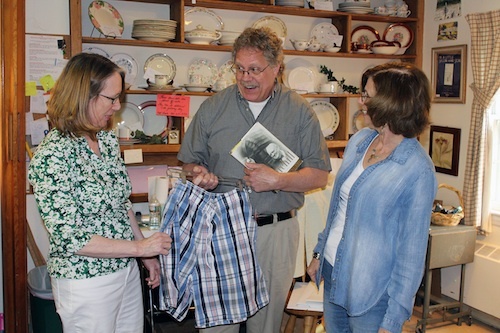 On April 24th, Brad Orton bought some shorts and a book at The Friends of Matheny’s Second Chance Shop in Gladstone, NJ, and the purchase put the thrift shop over the $100,000 mark for its current season, which runs until June 19. The Friends of Matheny is an organization dedicated to providing support to the students and patients at The Matheny School. Since its inception in 1983, the organization has raised more than $3 million to support Matheny’s programs and services. “This Morning” by Ellen Kane. 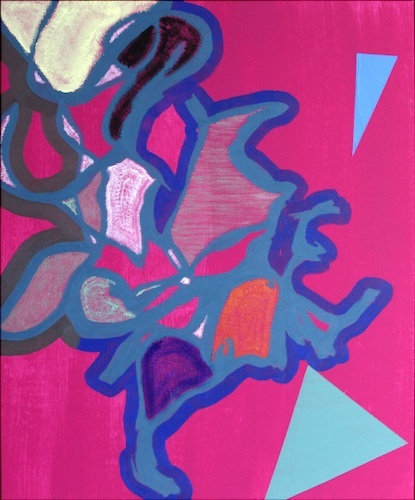 Thirteen Arts Access artists will have their visual art on display at the annual Collaborative Art Exhibition held at Rutgers New Jersey Medical School in Newark from May 17 through the end of August. Besides spotlighting the work of Arts Access artists, the exhibit features art from three other organizations for people with disabilities that have adapted the Arts Access Program and its methodology: The Arc Mercer in Ewing, NJ; Hattie Larlham Creative Arts Program in Twinsburg, Ohio; and the WAE Center of Jewish Services for the Developmentally Disabled in West Orange, NJ. A special Artists Reception will be held from 2 to 4 p.m. on Sunday, May 17 to launch the exhibition, which was coordinated by Noreen Gomez, facilities program specialist at New Jersey Medical School. 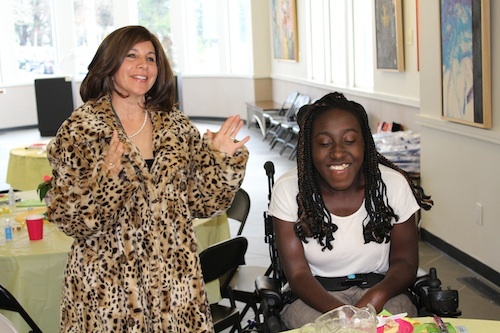 Arts Access provides individuals with disabilities the freedom to create in the visual, literary and performing arts. The Collaborative Art Exhibition is one of three four-month shows at the New Jersey Medical School, ranging from paintings and photography to sculpture, jewelry and textiles. From left, Maureen Prendergast, Andrea Soltesz and Lynn Nickerson demonstrate their aprons, transformed from napkins, pillowcases and shirts. The Friends of Matheny’s Second Chance Shop is celebrating its 30th anniversary, a milestone that lent a special festive atmosphere to Linda Horton’s annual “thank you” event for the shop’s volunteers. Horton, a Matheny trustee, manages the shop, which passed the $100,000 mark in sales for this season on April 24. Each of the volunteers attending the annual celebration event is asked to wear or bring at least one item purchased at the shop that can be modeled or demonstrated for everyone else. This year’s “fashion show,” as usual, was very entertaining. One volunteer wore a very unusual interchangeable item from Taiwanese designer Corinne Chen, and a group of volunteers showed how they could change napkins, pillowcases and shirts into aprons. Matheny trustee and parent Edana Desatnick, left, models a coat purchased by Matheny student Raven Bennett, right. Bennett volunteers at the 2nd Chance Shop. 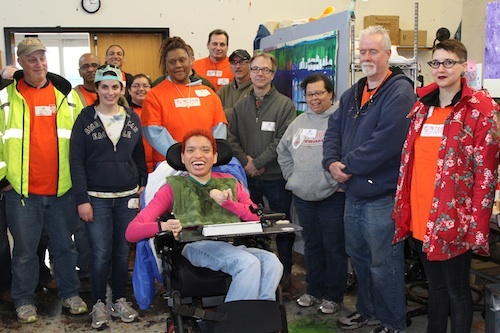 Home Depot employees, Matheny staff and students gathered in the front lobby after the work and tour were completed. On April 23, a group of about 20 employees from The Home Depot stores in Bridgewater, NJ, visited Matheny to plant gardens for a Matheny School science project and perform major makeovers for the nature trail and ball field. And that’s only the beginning. Plans are in the works for more projects in the near future. 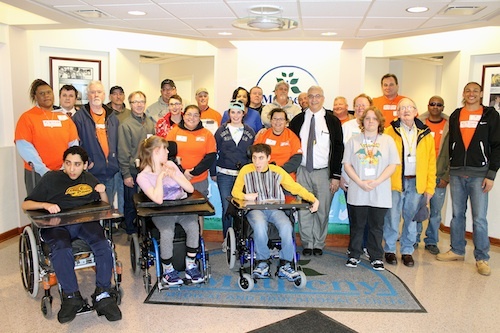 After the work was finished, The Home Depot team toured Matheny with Dr. Kendell R. Sprott, our CEO, and had an opportunity to visit with many of the Matheny students and patients. Thanks, Home Depot. Schonhorn Arts Center and met adult day patient and Arts Access artist Natalia Manning. Andy Lash at Miles for Matheny in 2013, with, from left, Dan Kane, Melissa and Jack Lash, Morgan and Fred Lash. That’s why Justin, his wife, Melissa, and son, Jack, along with his parents, Fred and Sue Lash, and sister, Morgan and her husband, Dan, will all be walking with Andy in the Lu Huggins Wheelchair Walk at the 18th annual Miles for Matheny on Sunday, May 31, in Peapack, NJ. The Lash family members have been participating in Miles for 15 years, and Justin estimates they have raised more than $50,000. This year, their Andy “Flash” Lash fundraising team has a goal of raising $5,000, and they had totaled $2,000 as of April 30. 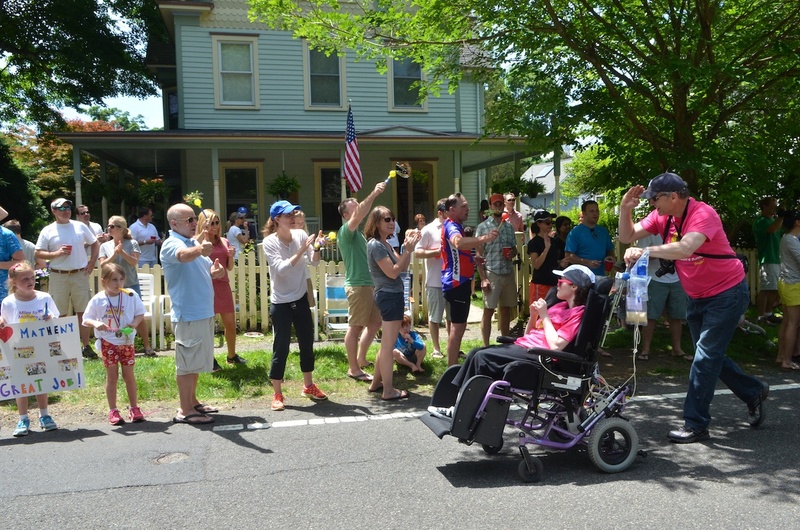 In addition to the Wheelchair Walk, which proceeds one mile around downtown Peapack, Miles activities include five Cycling rides, a Kids Fun Run, and a new one-mile Fitness Walk, which is stroller-friendly and precedes the Wheelchair Walk. There is also a “Breakfast of Champions” sponsored by The Friends of Matheny. The premier sponsor of Miles is The Poses Family Foundation. Other major sponsors are: The Golub Family, Mariner Wealth Advisors–Madison; Partlow Insurance Agency, Peapack–Gladstone Bank, Porzio Bromberg & Newman P.C. Attorneys at Law, and WCBS Newsradio 880. For more information or to register, log onto www.milesformatheny.org. To support Andy Lash, go to Search for Participant and type in Andy “Flash” Lash.